Good afternoon! It's another matchday and our glorious team has traveled north, on I-95, to the Land of Mitt Romney. That's right, it's Revs vs Red Bulls today, in a clash of MLS Eastern Conference Titans (7:00pm ET, MSG+, Galavision, match notes here)! Let's see how both of these teams come into this one. The Revolution come into this one undeated since a late May loss to DC United (1 win and 3 draws since). They're currently sitting in 7th place (Eastern Conference) and will be determined to pick up 3 points at home to stay in the playoff hunt. Their Red Bulls killer Shalrie Joseph is questionable for this one and their brand new DP will probably not play as well (awating International Transfer Certificate). Still, the Revs will have several offensive weapons on the field today. 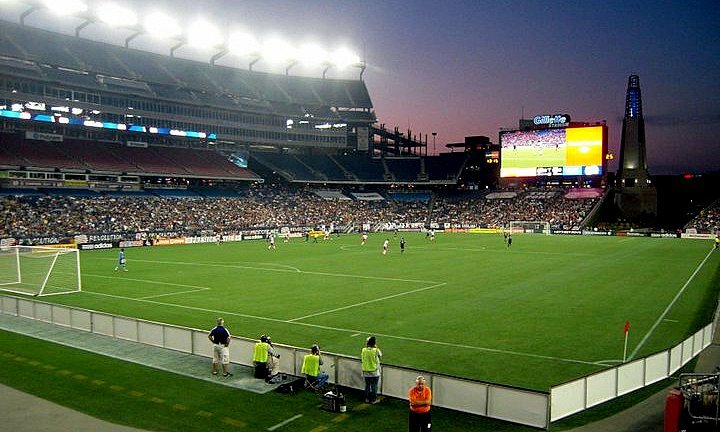 The Red Bulls have travelled, to the house of horrors that is Gillette Stadium, all banged up. Several key players did not travel, including Thierry Henry, Rafa Marquez and DJ Jan Gunnar Solli, and they could be without as many as six players. With a victory here the Red Bulls would jump to the top of the Eastern Conference and would be in a great position with a 3 game homestand looming. Will this be the day that the Gillette Stadium jinx is broken. We shall soon see. But enough of that, let's get to some predictions! I'm making the trip up to Foxboro on a Sunday night, which is apparently more than several of our superstars can bother to do. We haven't won at the Revs' god-forsaken, middle-of-nowhere stadium since 2002, and I don't expect that to change on Sunday. 2-0 Revs and I'll be left wondering why the hell I bothered on the long ride home. New England away has been a horror trip for us, going on 10 years now. Who can forget the Carlos Mendes and Tim Ream Own Golazos from recent years. That said, both players are no longer with our team and, more importantly, Shalrie Joseph is listed as doubful for the Revolution. If Mr. Joseph doen't actually show up, then I'm thinking we can pull off a draw (at the very least). I'm thinking Revs 1, RBNY 1. The Red Bulls haven't won a game in Foxborough since 2002, I believe. Combine that legacy with the rash of injuries and the team's complete unpredictability, and I'm hopeful that we'll come away with a 0-0 tie. The Revs are much, much better at home than on the road this year, and are unbeaten over their last four while our Bulls hope to extend their own such streak to the same tally. Looks like Conde will be the key. So long as our backline don't make too many sloppy errors, we can pull this off. Money's on New England but we often pull these surprises so I'll go for a 1-2 RBNY shocker to set us up for a nice summer home stretch. Alrighty then! We'll hope for three points and we'll have our usual Award Winning coverage in the next day or two. Hope to see you all next week @The Cathedral of Football, Red Bull Arena (built by Makita). Viper Out!